This post brought to you by AllWhites Egg Whites. The content and opinions expressed below are that of Growing Up Gabel. This vegetarian zucchini lasagna is packed full of veggies. Zucchini is layered with pasta, cheese, spinach, peppers and tomato sauce to create a family dinner packed full of vegetables. I am always looking for new ways to get my family to eat more vegetables. I personally love roasted veggies, but apparently eating them at every dinner isn’t as exciting to other people. 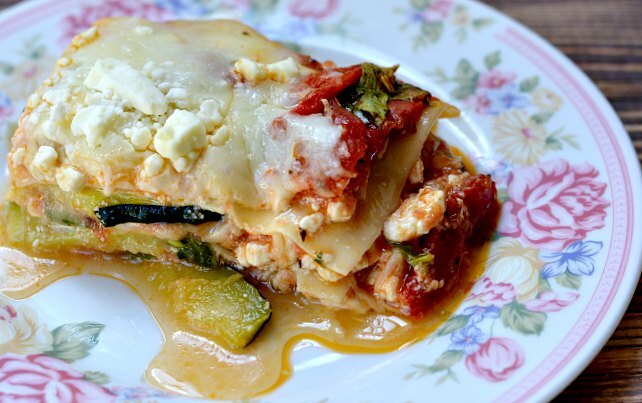 Last summer I saw vegetarian lasagna recipes made with zucchini “noodles” instead of pasta. They looked delicious but I never got around to making one – until now. This lasagna recipe uses a few pasta noodles, but is mostly vegetables. 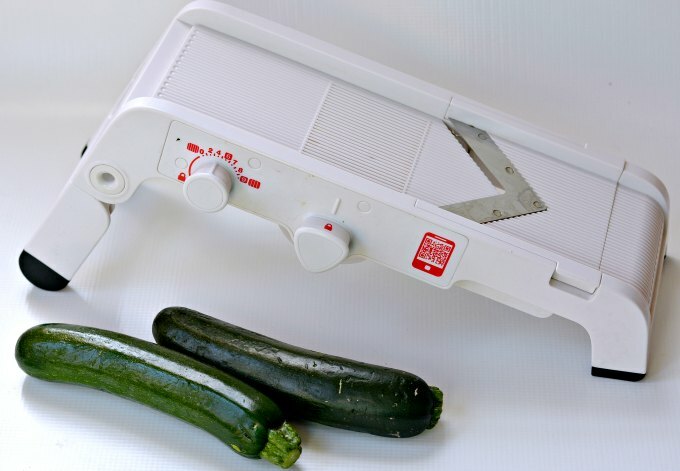 I have found the easiest way to slice zucchini is with a mandoline. They are a bit pricey, but worth every penny. See what great slices it makes? And it took about 3 minutes total to slice up all the zucchini. 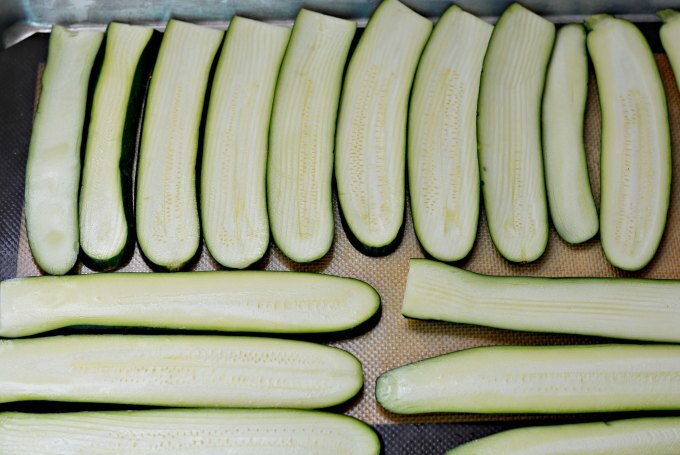 Once it’s sliced, through the zucchini in the oven for 15 minutes to roast. While the zucchini cooks, mix up the cheese and sauce. The tomato sauce is my homemade sicillian marinara sauce mixed with a can of diced tomatoes, fennel and cinnamon. It is totally worth picking up some fennel for this recipe. It’s also great in homemade turkey sausage – if you need another reason to buy it. The cheese is made with cottage cheese, lemon essential oil, feta, pepper and AllWhites® egg whites. AllWhites® 100% liquid egg whites are a convenient, fat-free, cholesterol-free and low-calorie alternative to regular eggs. They’re a lean source of protein and can be used in any recipe that calls for eggs. 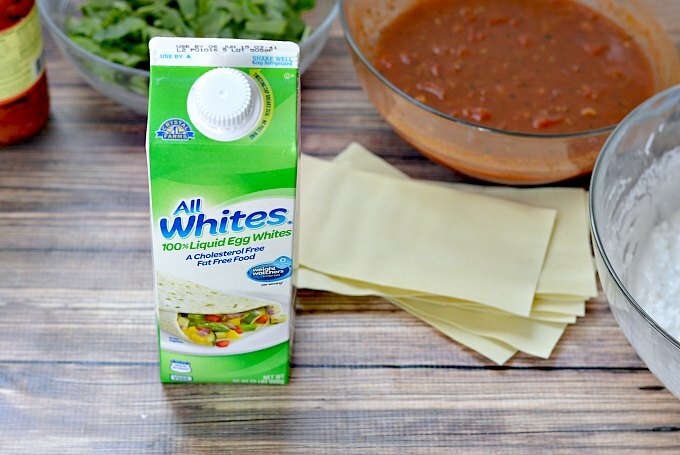 AllWhites Egg Whites have a 0 PointsPlus® value per serving on the Weight Watchers® program. You can find them in the refrigerated section. 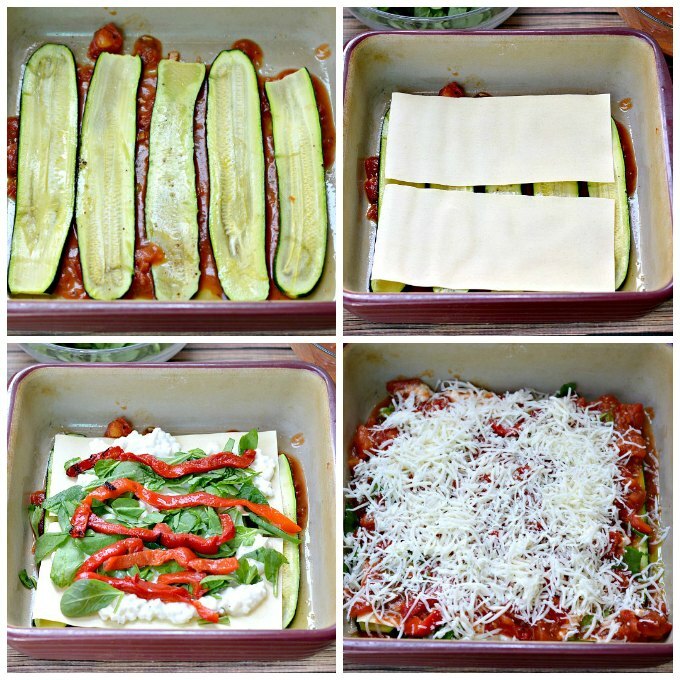 Once the zucchini are ready, it’s time to layer the lasagna. I’m really bad at measuring out thirds of big bowls but it still turned out fine (see the recipe for layering instructions). The lasagna needs about 50 minutes total baking and resting time. I was concerned about the amount of liquid in the dish given that vegetables are mostly water. It did have a lot of liquid, but that didn’t change the end result, which was deliciousness. Find more delicious recipes using AllWhites Egg Whites on the AllWhites Egg Whites Favorites website. Follow AllWhites Egg Whites on Pinterest and AllWhites Egg Whites on Facebook, too. Enter in the widget below to win coupons for a month’s worth of AllWhites Egg Whites! TERMS & CONDITIONS: This giveaway is open to US residents ages 18 and over and ends at 12:00 AM PDT on April 21, 2015. By entering you give the right to use your name and likeness. Number of entries received determines the odds of winning. Approximate retail value is $25.00. One winner will be selected. This is giveaway is sponsored by Izea. All liabilities and responsibilities with product is directly responsible by Izea and AllWhites. Winner will drawn by random.org from all verified entries, contacted by email provided, and announced on this page at the end of the contest. Winner has 24 hours to respond or prize will be redrawn. Entrant is responsible for the email address they provide, whether through typing it directly or through the Facebook entry method. Camille Gabel and GoldieBlox are not responsible for lost or misdirected emails. All prizes will be awarded. No prize substitutions allowed. This promotion is in no way sponsored, endorsed, administered by, or associated with Facebook and we hereby release Facebook of any liability. Information is provided to Camille Gabel and Izea not to Facebook and your information is never sold or shared. Facebook is not a sponsor of this giveaway. Prize is mailed or emailed directly by Izea or their associates and may require confirmation of delivery. Protected tweets do not count as an entry method for tweeting. Tweets must come from a public account. No purchase necessary. Void where prohibited by law. Heat oven to 450°F. Spray a 9x9x2-inch baking dish with cooking spray; set aside. Line a large rimmed baking sheet with parchment. Arrange zucchini strips in a single layer; season with salt and pepper and lightly spray with cooking spray. Bake about 15 minutes, turning once, until juices are released. Meanwhile, mix cottage cheese, AllWhites egg whites, 1/2 cup crumbled feta, lemon oil, and pepper in medium bowl until well blended. Mix pasta sauce, tomatoes, fennel and cinnamon in a medium bowl. Set cheese mixture and sauce aside. Spoon 1/2 cup sauce in bottom of prepared baking dish. Top with 4 to 5 zucchini slices, 2 noodles, 1/3 of ricotta mixture, 1/3 of the spinach and roasted pepper, about 1 cup sauce, and 1/2 cup Mozzarella. 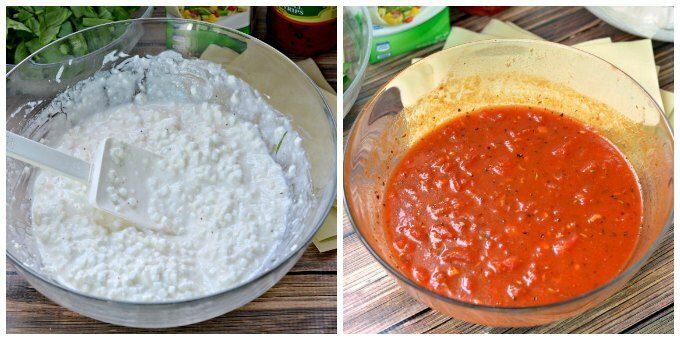 Repeat twice more, ending with sauce, Mozzarella, and remaining 1/2 cup feta cheese. Spray one side of an 18-inch piece of foil; cover baking dish sprayed-side down. Bake 30 minutes or until lasagna is hot and bubbling. Uncover; bake 10 minutes longer or until cheese is browned. Let stand 10 minutes before serving. This looks SO GOOD! I’m a vegetable lover and I want this NOW! I’ve saved it to my recipe box and can’t wait to try it. Thank you! 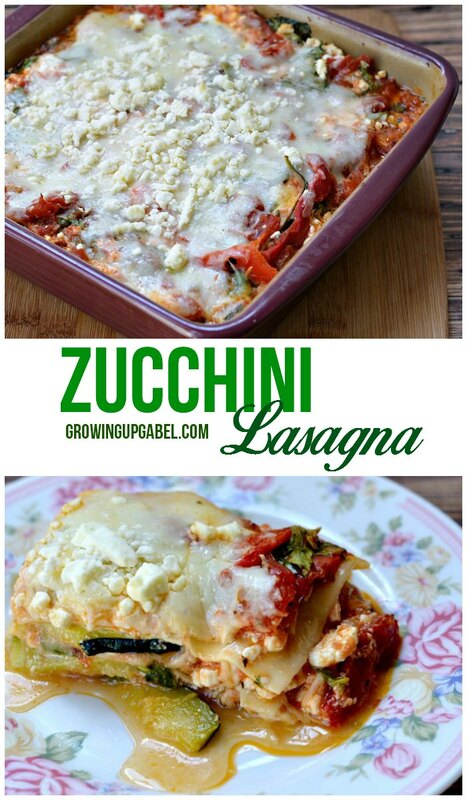 I LOVE zucchini lasagna, this recipe is a little different from how I make it… I need to try your way to see how it compares. YUM!! I really like how this one incorporates a little pasta – and then all those other veggies! Thanks for stopping by. This looks delicious! 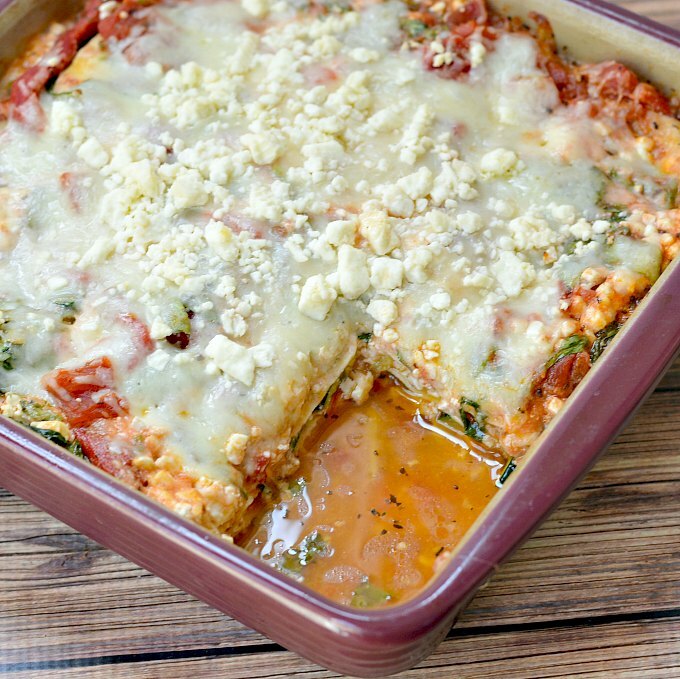 Lasagna in a favorite of mine and I am always looking for a new way to cook it. Thanks for sharing at the Thursday Favorite Things Blog Hop! Thanks, girl! It was amazing! We like to make lemon meringue pie! The only things I can think of that we currently cook using only the whites, would be a white cake mix or lemon meringue pie. We also use them as an “egg wash” for the tops of breads to give them that golden brown look. I imagine these could be incorporated into any recipe, so the sky would be the limit.